WESTBURY, NY--(Marketwired - October 08, 2015) - Aviation Maintenance Technicians must adhere to strict safety standards as dictated by the Federal Aviation Administration (FAA). Leaks, drips, seeps, bubbles or streaks in a fuel system indicate a problem that must be dealt with immediately. As the inventor of fluorescent leak detection, Spectronics Corporation has a line of effective leak detection products to address this issue. 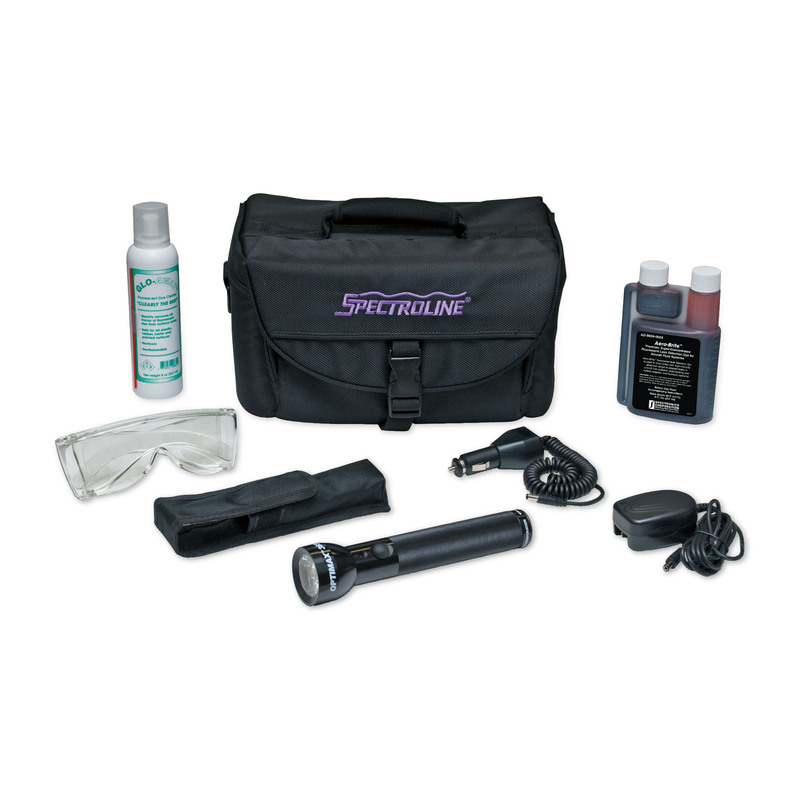 Spectroline® ALK-365 Aviation Fluid Leak Detection Kit is a "must have" for every technician. It's the most complete kit for finding leaks in aviation fuel, lubrication and hydraulic systems and works with all petroleum -- and synthetic-based lubricants and fluids. This reliable kit prevents expensive equipment breakdown and potential safety hazards. At the heart of the ALK-365 kit is the powerful, cordless and rechargeable OPTIMAX™ 365 UV LED leak detection flashlight. Engineered with state-of-the-art, ultra-hi-flux LED technology, this flashlight is four times brighter than other high-intensity UV lamps. The aviation kit also includes an 8 oz (237 ml) bottle of Aero-Brite™ universal fluorescent dye, which pinpoints the exact location of all aviation fluid leaks by a bright yellow/green glow. 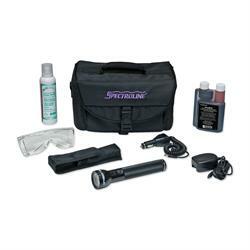 Rounding out the kit is an 8 oz (237 ml) bottle of GLO-AWAY™ dye cleaner, smart AC and DC chargers, rubber lamp protector, a belt holster and UV-absorbing glasses. All components are conveniently packed in a soft carrying case.